Well, not to all 50 states, or to all of the National Parks. We didn't write a song or learn a new skill in each state either. We didn't climb the highest peaks in every state or visit a Waffle House in every region. We didn't go to all the ballparks like on the MasterCard commercial. We haven't yet written the book and the final wrap-up slideshow and/or movie trailer isn't finished. But we still made it. We've finished our road trip, we're alive and well and living in Seattle, and we got our cat back. TravelinVan' 2 is always a possibility, since we've left some areas unexplored. If we had done it all, there would be nothing to look forward to. We've settled comfortably into our lives in Seattle. Anthony is trying his luck as a freelance web designer/developer, check out his work (or better yet, hire him!) at anthonyhecht.com. He also rants and raves fairly constantly about politics and such on the revived, revamped and reinvigorated slapnose.com. As for Liz, she's working a "real" job, and working to get her radio career off the ground on the side. She is also for hire at lizamelia.com, for all your media needs. Recently her first radio piece was aired on local community radio station KBCS! We expect they'll post her story here in the coming weeks. If you found our site through a search or followed a link, we'd like to say welcome and we're sorry you missed us while we were moving. 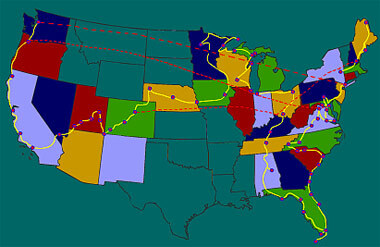 Please click the map above or the links to the left and explore our journey. For those of you who followed us on our trip, we offer our deepest thanks. It was a great trip, a real blast, and it wouldn't have been nearly as interesting without our readers. We met some great people along the way and can't wait to do it all again someday. Thanks again to everyone who supported us. We can be contacted through the websites mentioned above. We are retiring the turtle@travelinvan.com email address, as it gets about 100 spam messages a day and virtually nothing else. There may just be some life left in this project yet. Check back now and then.